I am amazed how many people don't know about Woodrow Wilson having a massive stroke and Edith Wilson taking over the White House. Usually when I speak someone will say oh yes I heard about that. And then they say they read about it in Eric Larsons book Dead Wake. I know exactly the passage they are talking about. I am a Eric Larson fan and read Devil in the White City and I devoured Dead Wake. The latest book DW is about the sinking of the Lusitania so how did Woodrow Wilson and Edith play into this? When the Lusitania slipped under the pearly green ocean Woodrow Wilson was in the middle of courting Edith Wilson. Wilson was writing torrid love letters when he was notified the Germans had sunk the Lusitania with Americans on board. To many this was the tripwire into World War I. Certainly Theodore Roosevelt thought so along with Henry Cabot Lodge. Roosevelt threatened to skin Wilson alive if he didn't declare war against the Germans. He didnt'. And here is where Larson swerves and gives the story of Woodrow Wilson and the woman fifteen years younger whom he would marry and then would take over the White House with only two years of schooling and no experience at all. Eric Larson goes further and delves into Wilson's stroke and the cover up and Edith's ascension. What is interesting is this is a sideshow to the Lusitania but it really stuck. History is really all about the sideshows and a case could be made that Wilson was severely distracted with his love affair and that this contributed to his reluctance to declare war. His volume of love letters dipped, then resumed. The Ardent Lover was not be put off and war would not be declared against Germany until 1917. 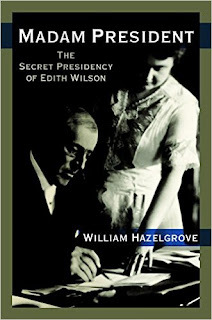 Such are the vagaries of history and the still untold story of Edith Wilson.